A proven goalscorer at League One level, having scored 38 goals in just 18 months at Port Vale, Leon Constantine joined Leeds United in the summer of 2007 as the club was about to experience life in the third tier of English football for the very first time. Constantine was born in London in February 1978 but was a relative late-comer to professional football. He made his league debut for Millwall in August 2000 before turning out for seven different clubs over the next seven years. 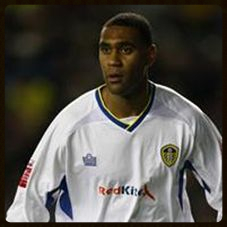 “I knew all about Leeds and the history of the club but I spoke to Dubes (Michael Duberry) and asked him his opinion. I had several offers and felt that I had proved myself in League One but Dubes told me that if Leeds United come calling, you don’t turn them down. “I was eager to get started but I never envisaged what was in store. “In one of the friendlies we played over there I had a coming together with the opposing centre back and immediately felt a severe pain in my leg which meant I had to leave the field. The x-rays revealed that the leg was broken, the news stunned the new man and the staff at Thorp Arch and it would be October before he was able to return to training. “It was incredible, Denis and Gus created a siege mentality and the confidence was sky high. I went to all the games and although it was good to see the lads tearing the league apart and Tresor (Kandol) and Jermaine (Beckford) scoring for fun, it was very frustrating as I wanted to be out there in the thick of the action. “I was involved in the squad and made my first league start away at Walsall in the middle of December but had to wait until New Years Day for my next action. In another cruel twist of fate, the injury hit striker suffered a broken arm and to this day he still has a plate in the arm as a result of the operation. “Denis left the club at the end of January and I never hit it off with his replacement Gary McAllister. He refused to give me a chance and in March I was loaned out to Oldham Athletic for a month before being allowed to leave on a free at the end of the season. “The time under Denis and Gus was fantastic. Everyone got on and the place was buzzing, that all changed when McAllister came in and the players didn’t seem to have the same confidence. “There were some great lads around the club. Tresor Kandol and Jermaine Beckford formed an incredible partnership, Seb Carole was a superb, much underrated footballer and I have all the respect in the world for the physio, Harvey Sharman, who helped me through some very dark, difficult times. Thank you to Leon Constantine for his time and giving me the opportunity to write this article.